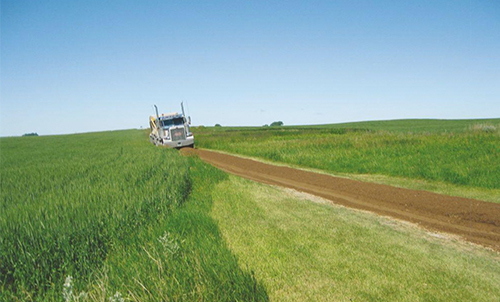 A gravel truck lays down another load on the old prairie path to the Sons of Jacob Cemetery. The road into the Sons of Jacob Cemetery got a new road. Ramsey County submitted a grant application for North Dakota Department of Transportation Special Road Fund program for a gravel project on the prairie trail going to the cemetery and was awarded the funds in November of 2017. The bids were opened in June of 2018, for the project, and one contractor, Gowan Construction of Oslo, MN., said they would donate the gravel required for the project at no cost. As part of the grant application the Ramsey County Commission provided technical assistance in determining the size of the project and also committed to providing a county blade and operator to do the finishing work on the project. Monday morning, July 16, the project took off, beginning with four loads (96 yards) of gravel right away in the morning. The project contractor is Gowan Construction, and Ramsey County Road Superintendent Kevin Fieldsend provided technical assistance. The blade operator was Gary Fenner, Starkweather. The cemetery established 1885, and is located on five acre parcel of land. The balance of land around the cemetery is native prairie grasses and native wildflowers and has never been farmed. The only physical reminder of the Ramsey County Jewish farming community and the oldest Jewish homesteader cemetery in North Dakota. It was the second settled Jewish rural area of the state with Jewish pioneers arriving in 1882. Others are believed to be buried at or near the cemetery giving the property significance from 1888, the estimated date of the first burial of a Jewish homesteader’s 19-month old child, Joseph Kaufman, through 1935, the year of the last homesteader’s burial in the cemetery. The Sons of Jacob Cemetery contains tombstones that are clearly distinct including natural field stones with carved art, one of the most notable expressions of traditional Jewish art. This unique culture of stone carving reached a particularly high level of development in the Pale of Settlement where the tombstones were honored as sacred relics in cemeteries and was brought to America by the Eastern European Jews. For more information on this fascinating piece of history and directions to Sons of Jacob Cemetery, go to www.sojnorthdakota.org.